Or will it run at full speed all the time even without tempering to any settings ? Share what im doing with my cooling as below . Second: What would be the best connector on my mainboard, it's connected to the AIO-pump 4pin connect, but my X370f strix motherboard also has the W-pump+ connector. Hi Matthew , 2.7k 2.8k is good like what i have .. Did you run it as full speed ? Try check this link : Liquid Cooling: Where do I connect the Fans and Pump? To dont create the same topic, I would like to confirm if the MasterLiquid 240 (which I own and is being RMA'd) has the same pump speed of the Pro Series. According to this FAQ answer, the speed is of 3000 +/- 10%. Because I would like to check the pump speed once my new unit returns. If anyone has this information, I appreciate. Could anyone confirm if the 240 has the same pump speed of the 240 Pro? Why the link saying that the MasterLiquid series have a 3000rpm speed for the pump was removed? IT IS AN OFFICIAL FAQ ANSWER TO A CUSTOMER!!! I'm in a dispute with my regional support and I need this information to get a refund (I'm so pissed). My unit, which was sent me after an RMA (pump noise), won't go past 2500rpm (way below the 10% limit). My initial suspicion was that they sent me a weaker pump to masquerade the pump noise. Now they are saying that the unit is OK and that it is not defective (running at 2500rpm). Was it related? Did you guys put down the link with the 3000rpm information because of my dispute? This is so strange. 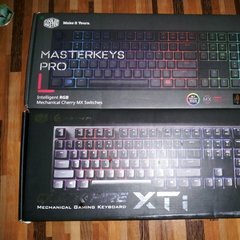 Could any representative of Cooler Master give me an answer?